Address: Erzsébet királyné útja 13-15. Let yourself to be enchanted with the elegance and classical ambience of a traditional hotel and a unique natural wonder, the magic of the Hévíz thermal lake! Where can you experience all these? The answer is short: Hotel Erzsébet Hévíz. Price includ: breakfast, halfboard (lunch or dinner), wellness /infra-,finn-sauna, steam-bath , jacuzzi/, bathrobe-, safe use, wifi use. 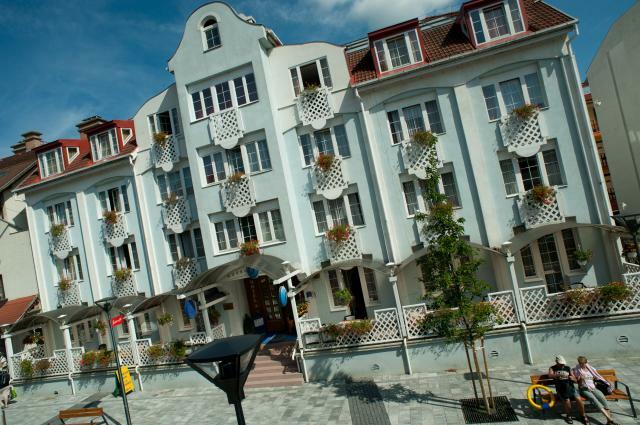 The hotel is located directly at the entrance of the thermal bath. Your comfort is guaranteed by 48 tastefully furnished hotel rooms, out of these; three rooms are enlarged with living rooms. Our rooms are equipped with: air-conditioning, own bathroom, television, radio, telephone, safe and mini bar. Your car can be parked at the best place, in the deep garage of our hotel. Experience the healing, health-preserving wonders of Hévíz, this small town is like a jewel-box, use our hotel for a genuine family recreation, visit us and gain your vitality back! Experience the unique gastronomic offer of Hotel Erzsébet in our opened, classical styled and air-conditioned restaurant. Our cooks prepare dishes with Hungarian and home-made flavours. Of course, those who look for international, dietetic, grill and vegetarian cuisine can find dishes to their liking as well. Spend an atmospheric evening with your partner or with the pleasant company of your friends on the terrace of our restaurant and start your morning with a delicious breakfast in pleasant sunshine! In our patio we wait our guests with wine-tasting and grill-parties with music in the evening! The pleasant Drink bar with its wide-choice of beverages and confectionaries and its intimate environment attracts you to spend a delightful afternoon or evening! “More than twenty thousand years ago nature presented our settlement with a unique treasure. The green heart of Hévíz is the 4, 4 hectare lake, which is the biggest thermal lake of the earth being suitable for bathing. We share this treasure and alongside with it the experience of health with all our visitors. Therapeutical activities are based on 200-year old experience and it is no wonder that the so- called medicinal weight bath was born in Hévíz, which is used all over the world nowadays.